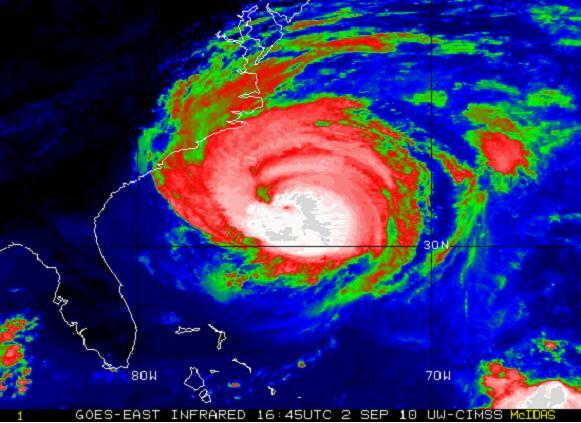 Hurricane Earl has just begun to weaken a bit , now a Category 3, but still huge; about 400 miles across with 75mph+ winds 90 miles from the eye. He has taken his expected slight northerly turn. North Carolina starts feeling it this afternoon and then really gets it tonight. The winds are expected to die down a bit over cooler water and then Earl is likely to speed up as he heads directly for an encounter with Cape Cod tomorrow night and into Saturday. Looks like the 50 mph+ winds are definitely going to be felt along the shorelines and tropical storm winds may be felt pretty far inland. This is what Paris Hilton tweeted on July 25th- along with the caption, “Love My New Chanel Purse I got Today. :)” RadarOnline.com put 2 and 2 together as they compared this picture to video of her recent Las Vegas cocaine arrest in which a very, very similar purse was caught on tape. This is the purse Hilton told police she had “borrowed” from a friend. Still, you have to give her credit for thinking so fast and coming up with such a clever excuse. Busted by her own vanity? 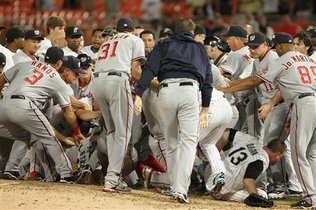 My- what a brawl in Florida last night as the Nationals and Marlins went at it. It’s complicated. I will have to presume some basic knowledge of the situation but here it is in a nutshell. Basically, the Nats have a Center Fielder in Nyger Morgan who’s become a bit unhinged lately. He ran into an opposing catcher last week who didn’t even have the ball. He’s been handed a 7-game suspension for throwing a ball into the stands in the direction of fans who were heckling him. Tuesday night in Florida, he was headed for home, looked like he could have slid, but instead, ran headlong into the Marlin’s catcher, separating his shoulder and knocking him out for the season. So last night was all about the expected revenge the Marlins would take on Nyger. These are the customs and culture of baseball. So he gets plunked by a 92 mph fastball in the 4th inning wiith the Nats getting clobbered by ten runs and Nyger accepts his “punishment” and goes to first. Apparently, when you’re that far behind, baseball’s unwritten rules also dictate that you don’t steal bases. But Nyger has been a little edgy lately so he figured, screw it, I’m stealing second. And then third. And then he scored on a fly ball. For violating these unwritten rules, they didn’t hit him, they threw behind his head in the 7th inning. Nyger lost it, charged the mound, benches emptied, high drama. Nat’s Manager Jim Riggleman, bless his heart, defended his crazy little guy and I tend to agree, at least on one point. Screw the customs and unwritten rules of baseball when it comes to stealing bases and scoring runs. It was the 4th inning. As it turns out, the Nats made a game of it. If they didn’t like what he was doing, the Marlins should have tried to throw him out. Also…the unwritten rules of baseball do not include trying to hit a guy twice. Anyway, we’re not going to be seeing Nyger for awhile, I suspect. He’s already got a 7-game suspension plus whatever they add on for the little fight he started last night. Oh, and as one of his coaches was walking him off the field after the fight, he strutted, thumped his chest and jeered back at booing fans. That’s probably extra suspension time too. A class act; not exactly. A one-man baseball crime wave? Possibly. Starting CF for the Nationals next year….I don’t think so. But he certainly has made it a fun week to watch baseball. By the way, the Marlins come into town next week. Should be a raucus good time.